First edition, first print hardback of THE ASK AND THE ANSWER: CHAOS WALKING Book Two, by Patrick Ness and published by Walker Books Ltd., London, in 2009. Signed and inscribed by Ness on the title page. With full numberline 2 4 6 8 10 9 7 5 3 1 on the copyright page. The book is in very good condition (Clean blue/silver decorated boards with silver/green lettering on the spine and on the front), with minor wear to the decorated clear glassine dust jacket which is not price clipped (very slight rubbing to the corners). Internally, the pages are clean and tight and there are no tears and no other inscriptions. 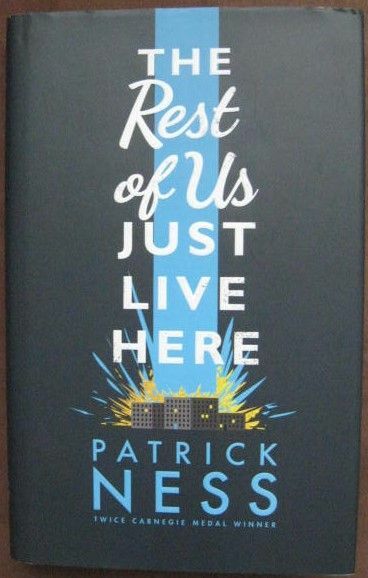 Patrick Ness is the author of the award-winning Chaos Walking trilogy plus two acclaimed works of fiction for adults. His writing career exploded in 2008 with The Knife of Never Letting Go, which was published to critical acclaim and won the 2008 Guardian Children's Fiction Prize and the 2008 Booktrust Teenage Prize. The second book in the trilogy The Ask and the Answer is, if anything, even more sensational, winning the 2009 Costa Children's Book Award. The judges proclaimed that 'from the first word, we were gripped by this dazzlingly-imagined, morally complex, compulsively-plotted tale. We are convinced that this is a major achievement in the making.' Monsters of Men, the third and final book in the Chaos Walking trilogy, was published in May, 2010. Patrick was Booktrust's first appointed Writer in Residence, and is a literary critic for the Guardian. Lions Gate Entertainment acquired worldwide distribution rights to a film adaptation of the "Chaos Walking Trilogy", to be produced by Doug Davison's production company Quadrant Pictures. Oscar winning writer Charlie Kaufman will be writing the script for the film adaption for The Knife of Never Letting Go. In the Chaos Walking series, the story is set in a dystopian world where all living creatures can hear each other's thoughts in a stream of images, words, and sounds called Noise. The series is named after a line in the first book: "The Noise is a man unfiltered, and without a filter, a man is just chaos walking." The series consists of a trilogy of novels and three short stories. The Ask and the Answer is the second book in the Chaos Walking series and events continue immediately from The Knife of Never Letting Go. Fleeing before a relentless army, Todd has carried a desperately wounded Viola right into the hands of their worst enemy, Mayor Prentiss. Immediately separated from Viola and imprisoned, Todd is forced to learn the ways of the Mayor's new order. But what secrets are hiding just outside of town? And where is Viola? Is she even still alive? And who are the mysterious Answer? The second thrilling volume in the Chaos Walking Trilogy, The Ask and the Answer is a tense, shocking and deeply moving novel about resistance under the most extreme pressure."